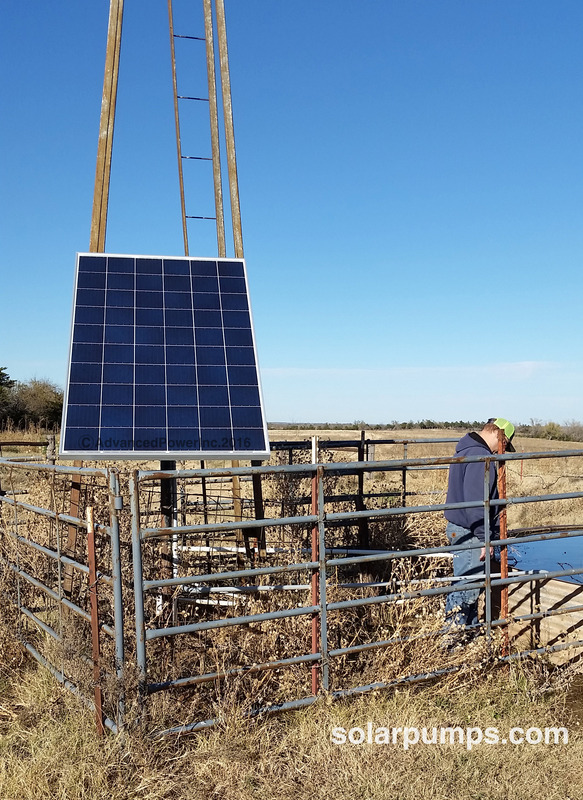 The N-series API systems provide similar strength, durability, and production as our other complete solar systems, but do so with increased efficiency that complies with government conservation standards, known as NRCS. Please contact your local FSA office to check availability of funds & product eligibility. 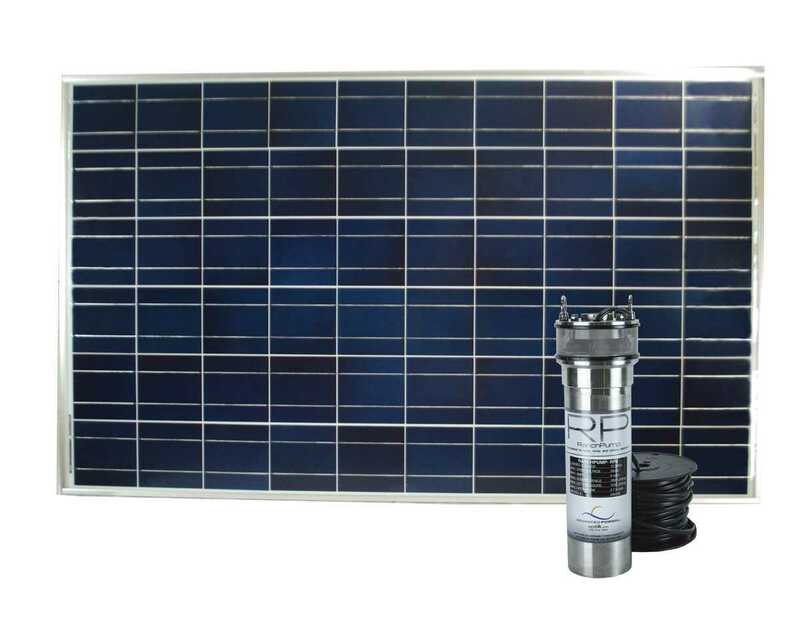 This N250RP2 solar pump will produce more water and lengthen the pumping day, even in low light, by starting the pump up earlier and running longer at max GPM. This N250 system is more efficient on cloudy days due to having more than 30% more power than the K170 or K255. Deliver up to 1350 gallons per day at 2.3 GPM maximum, based on a 9-hour run time. 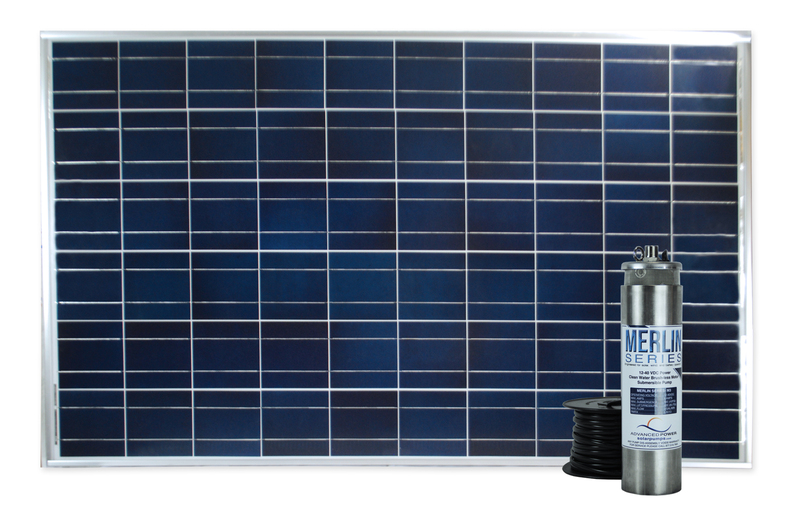 UL Listed solar panels include a 25-year power output warranty. Extremely durable, adjustable certified engineer stamped aluminum mounts. Pre-assembled with aluminum mounts, wire harness, On/Off power switch. Long life brushless motor RanchPump2 with 100’ of wire and a 3-year warranty. Professionally built in the USA. Bulk discounts available, please call for pricing. 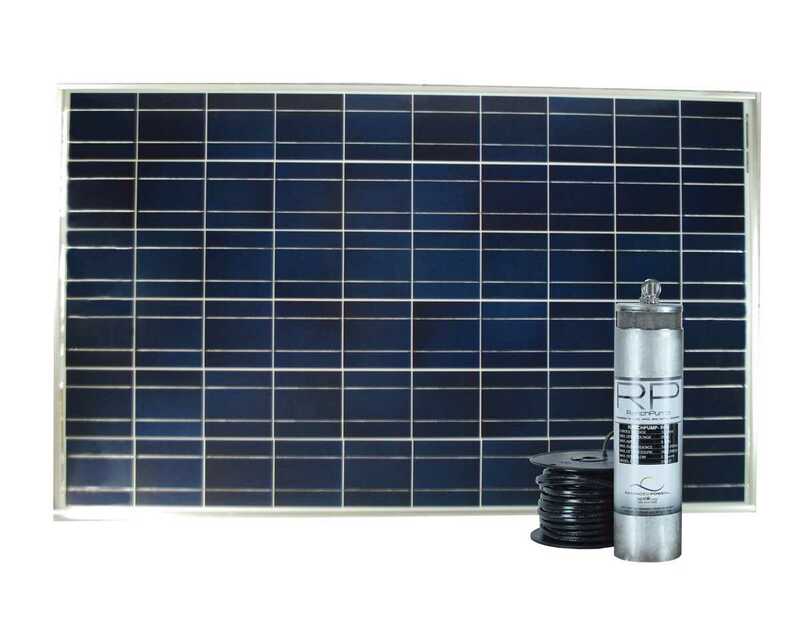 (1) 250-watt 32-volt Advanced Power Inc. solar module. 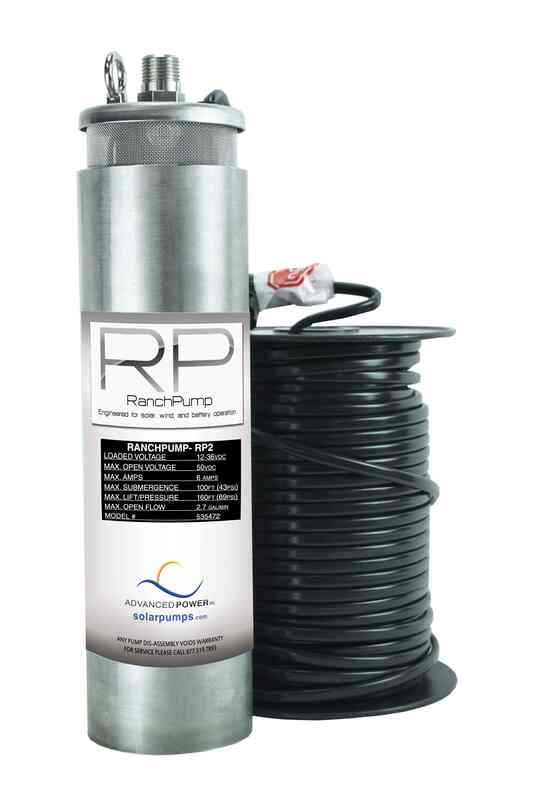 (1) RanchPump2: 12-40 VDC aluminum submersible dual piston brushless motor solar pump comes with 100’ of attached wire attached. Includes a 5-year manufacturer’s warranty (with registration / 2-year warranty + 1 year additional pro-rated). Pre-assembled with aluminum mounts, wire harness, On/Off power switch, and ALC 1275 (if purchased). (1) High-voltage On/Off power switch. RP2 pumps require a 4” or larger well casing. 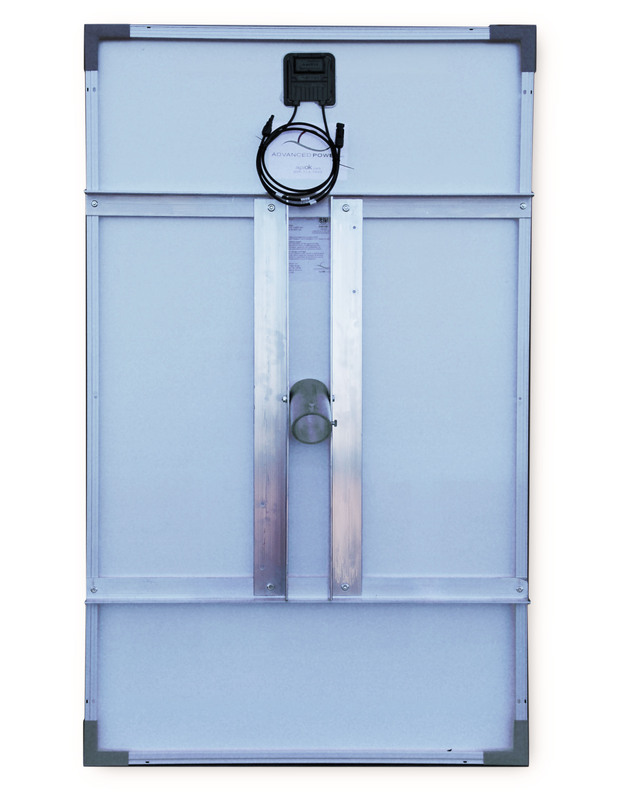 N250 panel systems require a 2 7/8” OD pole. Flows decrease as depth and pressure increases to maximum depth of 150 feet (65 PSI). At times the government will provide rebates or tax incentives for solar pumping systems that meet their requirements through the NRCS. Contact your local FSA office for availability of funds and eligibility. No additional controller is required for API solar water pumps, however the ALC 1275 greatly increases the life expectancy of our aluminum pumps and prevents unnecessary wear and tear on the pump. Please be sure your well has been tested for flow rate and continuous flow supply. In order to reach these water demands, your well must be able to keep up with the solar pump. Otherwise, damages can occur. Do you have wind turbines within 1/2 mile of your solar pump system? Find out why your system can become damaged here. Don't forget to prep your system for the winter!! Weep holes are a must! Ground Rods are great for preventing damage from lightening spikes, we highly recommend ground rods for solar systems. Custom systems available up to 1200 GPM (Gallons Per Minute). Please visit our custom page to contact us.